The Mekong River is the 12th longest river in the world with a length of approximately 2,700 miles. It flows from the Tibetan Plateau which has an altitude of more than 16,000 feet to the Mekong Delta into the South China Sea. The source of this river is Qinghai Province and it flows through China, Laos, Myanmar, Vietnam, Thailand, and Cambodia. The total watershed is approximately 307,000 square miles and the discharge is around 110 cubic miles. It is fed by numerous tributaries along the way. The major tributaries of the river include Tha, Nam Ou, Mun, Kok, Ruak, Tonle Sap, Nam Khan. Mekong River is also known as Lancang Jiang by the Chinese people that means “Turbulent River”. For the Vietnamese people, this river serves as an important transport channel and also a trading center. The river’s basin covers a huge area and more than 80% of the people living in the area rely on the river for agriculture and fishing. The region is also the second most biologically diverse area in the world after the Amazon River basin. It also contains the largest inland fishery in the entire world. No other river has so many species of large fishes. Antonio de Faria, a Portuguese man became the first European to see this river in 1540. 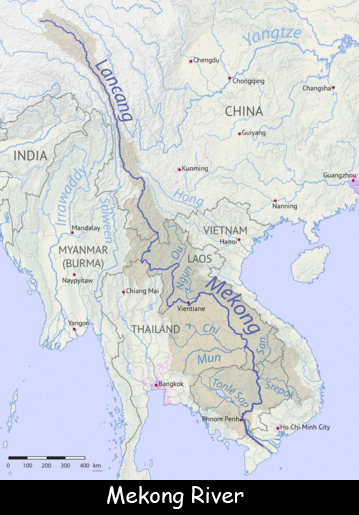 The water flow of the Mekong River can reach up to 500,000 cubic feet per second and its lower basin can get flooded during the monsoon season. Approximately 43% land area of the lower Mekong basin is covered by lush, green forest. Declan, Tobin. " Fun Facts for Kids about Mekong River ." Easy Science for Kids, Apr 2019. Web. 24 Apr 2019. < https://easyscienceforkids.com/mekong-river/ >.